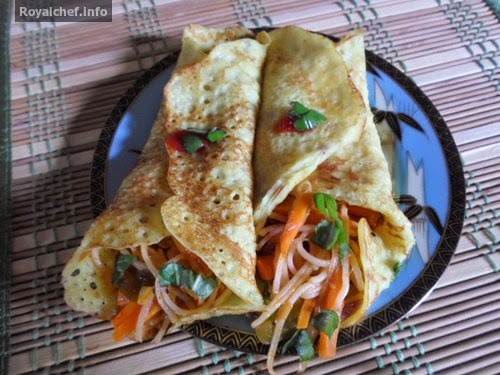 This is a Recipe for preparing at home tasty Indian Style Pan cakes with Vegetables. These Pan cakes are made of Rice flour and egg mixture and a stuffing of assorted vegetables, a delicious and filling snack or even a main course item. For the Pan cake mix all the ingredients together. The batter should not be too thick. For the stuffing, heat 1 table spoon Oil in a Kadhai and then add the Salt and Schezwan sauce and then add all the Vegetables, mix it well and cook for 2-3 minutes on a high flame. Heat a Frying pan and drizzle Oil and pour in some batter. Spread the Oil evenly across the Pan and cook for 2 minutes on a slow flame. Turn the Pan cake over and cook for 2 minutes on a slow flame. 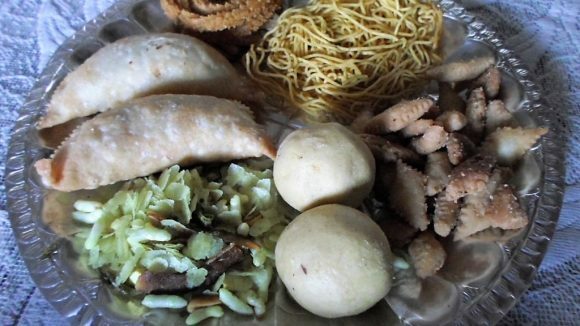 Remove it from the frying pan and place the Vegetables in the center and roll the pan cake. Serve hot.